I remember, back in high school, getting the first 3 issues of the Longshot mini-series from a friend. I read those over and over again blown away by the Art Adams art. But growing up in a small East Texas town, I couldn’t easily or affordably get the last 3 issues to finish the story. So I kind of just forgot about it. I was very glad Marvel put him in the X-Men Annuals, then into the Uncanny X-Men series to get a monthly dose of a cool character. Recently, friend and fellow comic artist, Jonboy Meyers, gave me the Longshot hardcover. I love seeing all the thumbnail, prelim, penciled pages and character designs by Art Adams, one of my earliest and biggest influences. Now I know the whole story. Thanks, Jonboy! 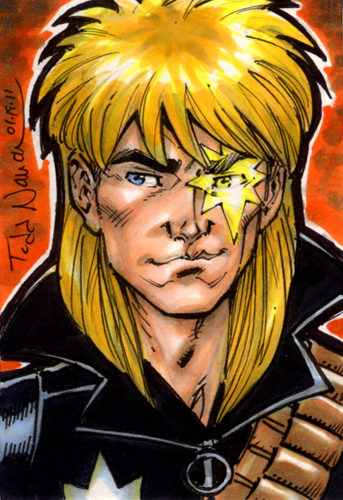 This entry was posted in Sketch Cards and tagged comics, copic, longshot, marvel, pigma micron, sketch card, superhero, x-men by Todd Nauck. Bookmark the permalink.